I've had a couple people report that they were convinced there was a problem with the registration process. So far, this has been 100% user error of the ones I've seen. 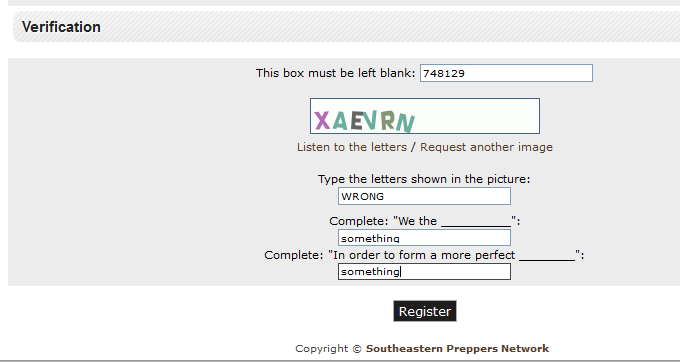 If you feel that you've completed everything correctly and can't get registered, I need two screenshots. One from before you hit the submit button and one from after - the filled in form and the result. This is in lieu of the more popular report of "I typed the stuff in to the thing and got some kind of error or something". Post your screenshots on this board. Do not post any other content on this board! This board will be wiped daily. Meanwhile, here are two things that might help with the form. Notice in the second (error message) screen shot above, there are TWO lines that say "You did not answer the verification questions correctly" and they're separated by "The letters you typed don't match the letters that were shown in the picture". These appear to be shown in order. If you're consistently getting "You did not answer the verification questions correctly", try deliberately entering the letters of the Captcha incorrectly. This time, when you get the error page, see if the "You did not answer the verification questions correctly" error is above or below the "The letters you typed don't match the letters that were shown in the picture" error. This tells you if your problem is with the verification above or below that part on the registration page so you can focus your efforts. Thanks for the help on this. Great job. "There is no better friend... and no worse enemy than a United States Marine."